Trustelem Connect protects your users' access to business applications and improves the ease-of-use of your information system. Use Trustelem Connect for both SaaS applications and internal applications, for internal collaborators, partners, and customers in your organization. Trustelem Connect is easy to use for both users and IT teams. Regardless of how users feel concerned about security issues, their first requirement is that access procedures to their IT system must be efficient. User experience and agility are key to user satisfaction. They are also the principles upon wich Trustelem is built. This is a sine-qua-non condition for users to accept the implementation of security measures. 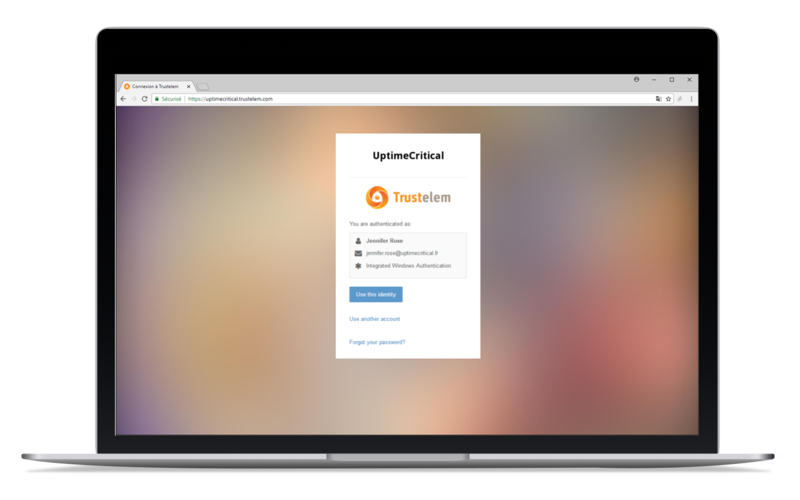 Once authenticated to Trustelem, users can securely navigate throughout the applications shown on their personal dashboard. Their dashboard lists all applications for which they have an access right in their current networking context. Alternatively, users can bypass the dashboard and go directly to the application. 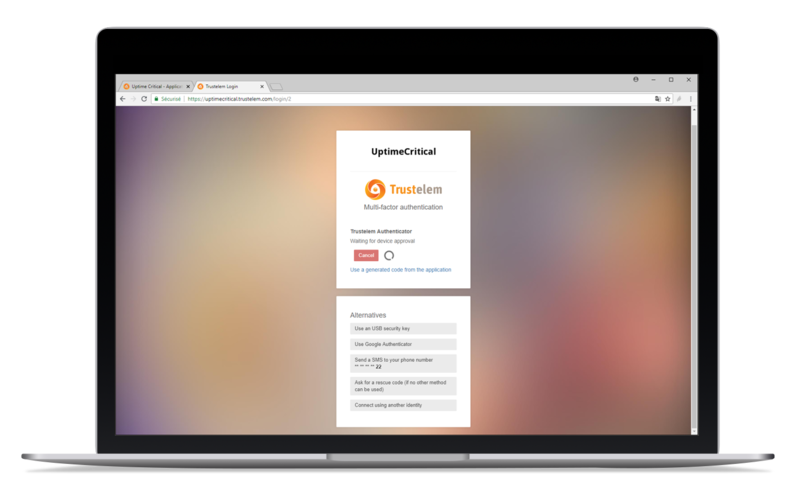 Applications will delagate the authentication process to Trustelem, acting as a trusted third party. When accessing applications from a device linked to an Active Directory domain, users are automatically authenticated through Integrated Windows Authentication. The user's Kerberos ciphered token is sent to Trustelem and checked by the domain controller. Upon approval, Trustelem silently and securely grants access to the user's dashbaord and/or target application. When user device is not linked to an Active Directory domain, users authenticate with their Active Directory password. Active Directory password are never stored by Trustelem. Instead, they are checked in real time by one of the available domain controllers. Trustelem implements redundancy, failover and recovery mechanisms for the connection with domain controllers, so that users continue to connect even during partial failures of the client infrastructure. Each organization has its own constraints on multi-factor authentication. The adequacy of this type of solution to an organization varies according to the need for security, the populations it has to deal with, the devices being used and the budget. This is why Trustelem provides its customers with several complementary solutions that can be used together, depending on the needs of each user and the data they access. Trustelem offers 6 multi-factor authentication solutions to suit the needs and constraints of your organization. Trustelem Authenticator is a mobile application that offers a strong authentication solution which is both easy to use and secure. Within network coverage, Trustelem Authenticator receives push notifications. When the device is offline, the application generates a 6-digit code. In addition to users locking their device, the application can be fingerprint protected or using a four-digit PIN. Trustelem Authenticator is included by default in your Trustelem subscription. The app is available on Google Play, the Apple App Store and the Windows Store. InWebo Authenticator is a mobile application published by InWebo, technology partner of Trustelem. 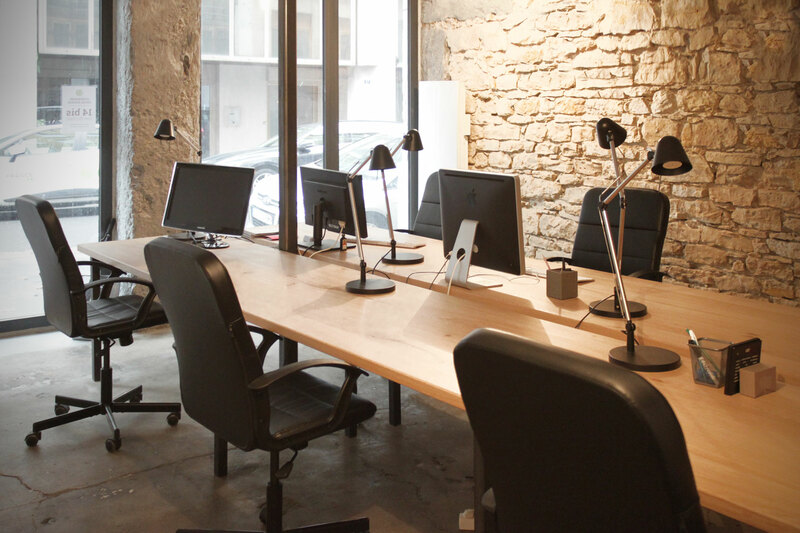 The application has received CSPN certification from the French cybersecurity agency, ANSSI. It relies on push notifications and implements patented authentication mechanisms. InWebo Authenticator is available as an option. The app is available on Google Play, the Apple App Store. SMS authentication remains a simple and practical solution, widely known in other contexts by users. It is offered as an option. Trustelem supports the FIDO U2F protocol to implement multi-factor authentication based on USB physical keys. If you do not have your own set of keys, Trustelem offers, via its technological partnership with the manufacturer NEOWAVE, FIDO U2F keys meeting the highest security requirements, whose cryptographic module is certified according to Common Criteria at EAL5 + level. , at favorable rates. FIDO U2F support is included by default in your Trustelem subscription. The use of such an application is included by default in your Trustelem subscription. 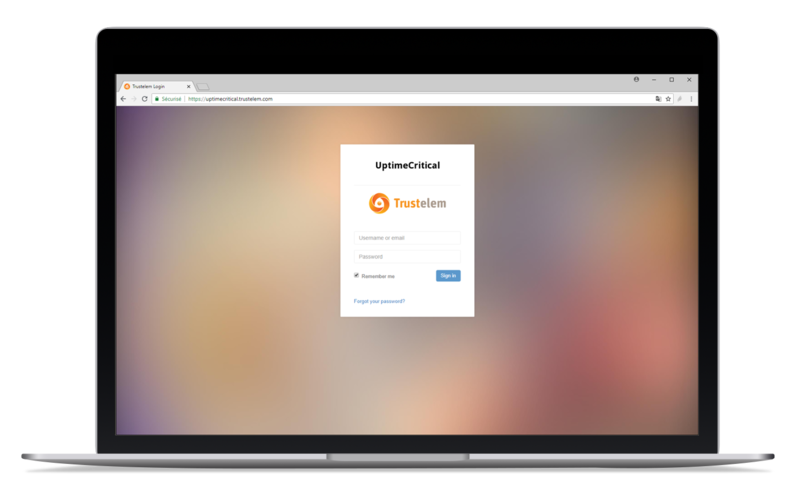 Trustelem integrates with your PKI and allows authentication via asymmetric challenge-response. The use of this authentication mechanism is included by default in your Trustelem subscription. Your users forget their password too often and turn to your helpdesk. This creates stress, a waste of time for the user and costs for your IT helpdesk. Trustelem Reconnect allows your users to recover their Active Directory password independently, after re-authenticating with one or more add-on solutions such as the Trustelem Authenticator mobile app, an SMS, one or more secret questions and other solutions. Trustelem Reconnect is available directly on the Windows login screen of workstations and also on the web. 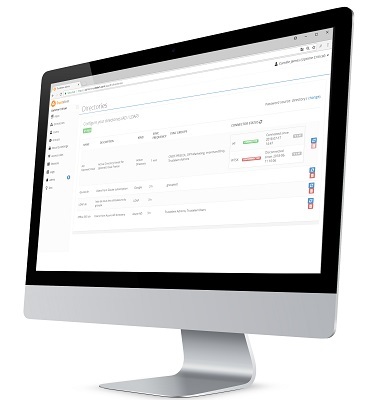 Trustelem is designed so as to make administration simple and intuitive. A web-based administration console enables IT staff to setup directory synchronization, manage life cycles of external user accounts and applications, create and adapt access rules, monitor activity and audit access security. 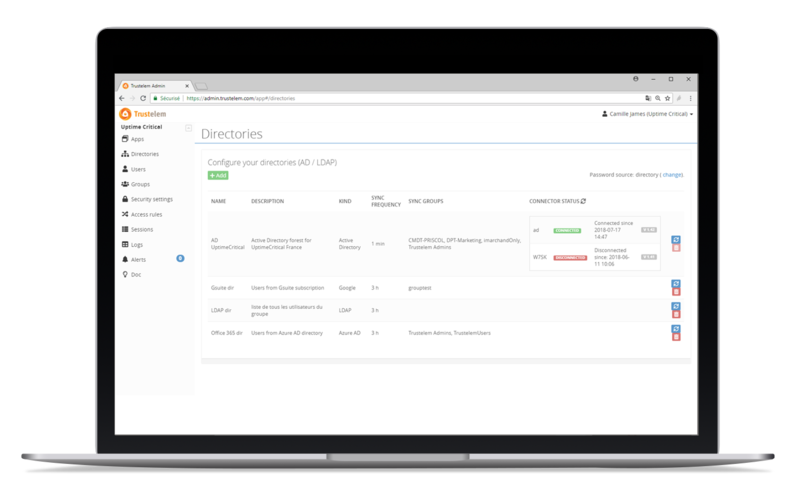 Trustelem's exclusive directory synchronization technology consolidates your user databases from multiple sources: Active Directory, LDAP, Azure AD, G Suite. 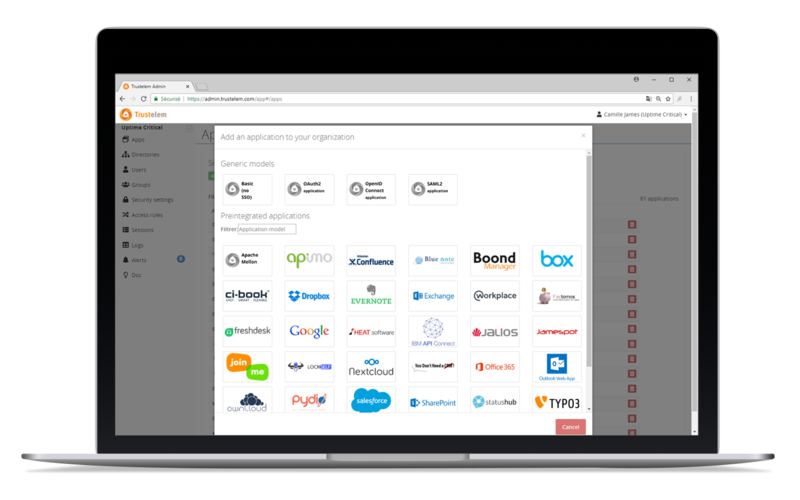 Trustelem's proprietary directory synchronization technology consolidates your user databases from multiple sources: Active Directory, LDAP, Azure AD, G Suite. Used with the connector Trustelem AD Connect, Trustelem launches Integrated Windows authentication to automatically connect users from their workstation. For added security, Trustelem does not store user passwords: queries to directory servers are made each time a user requests authentication, over an encrypted, authenticated and redundant connection. 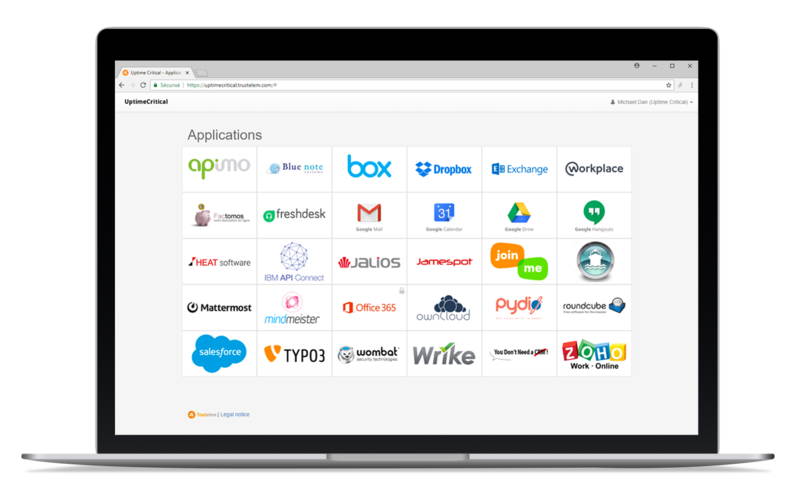 Many applications, whether distributed in SaaS or deployed locally, are pre-integrated with Trustelem: Office 365, G Suite, Salesforce, Dropbox and many others. The procedures are specific to each pre-integrated application: just a few minutes are enough to establish the link with Trustelem. In addition, Trustelem integrates with any application that supports SAML 2.0, OpenID Connect, or OAuth 2.0. Trustelem allows you to define in a few clicks who has access to which application and according to which authentication policy. Permission rules are available by application and by population. Depending on the source area of the request - internal zone or external zone - you specify whether the user should use multi-factor authentication or if only one factor is sufficient. No complex combination of security policies, no conjunctions of rules of authorization and prohibition: the rules are at once expressive, simple and auditable. Would you like to adapt Trustelem's behavior? Add an attribute? Select the identifier to transmit to the application according to your own criteria? Trustelem lets you run programs to modify the answers provided to applications, bringing a unique level of flexibility to the market. Do you want to use SMS or the InWebo application as multi-factor authentication mechanisms? Do you want to deploy a self-service password reset solution? Would you like to contact Trustelem technical support by phone at any time? With its decreasing pricing model, Trustelem suits small, medium and large companies.